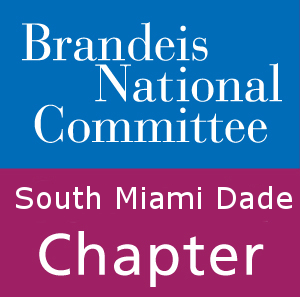 Welcome to the South Miami Dade Chapter of the Brandeis National Committee! We are a vibrant, active group of lifelong learners who are committed to expanding our knowledge, supporting Brandeis University, and helping out our communities. The chapter consists of over 450 members from Aventura, Bal Harbour, Coconut Grove, Coral Gables, Hallandale, Hollywood, Key Biscayne, Miami, Miami Beach, and North Miami Beach, as well as seasonal residents of the region. We are a group committed to furthering the values of Brandeis University: intellectualism, academic excellence, and social justice in the form of community service. While some of our members are Brandeis alumni or family of alumni, the vast majority have no official affiliation with the University. Through our fundraising efforts we continue to ensure the University’s ability to provide an excellent education to the brightest minds, and break ground in the scientific world. All of our financial support for Brandeis goes directly to the libraries, student scholarships, and scientific research. In addition to supporting a notable institution, BNC South Miami Dade acts as a social hub for its members. We offer a number of learning and socializing opportunities for our member throughout the year in the form of study groups, guest speakers, and trips. These are excellent opportunities to spend time with old friends and meet new ones while exploring mutual interests. All of our study groups and events are designed to be informative, fun, and thought provoking. They span a wide range of topics including film, theater, local attractions, literature and book clubs, social issues, history, and much more. We encourage any prospective members to sign up as soon as possible to begin participating. The chapter has a “buddy system” to help welcome new members to the chapter. Please don’t hesitate to reach out with any questions concerning membership or participation. We can’t wait kick off another wonderful BNC year together!